“Hi to everyone checking-in to the Royboy Productions Site ! Hope you got to meet-up with Travis if you were with us at the KKOA Leadsled in Salina ! He’s always got cool stuff for sale…ya need some of it for your collection ! GENE WINFIELD HAS BEEN ONE OF the most prolific Rod & Custom Builders in the Industry for almost 70 years ! BUT, what many aren’t aware of, is the fact that for many years Gene also created some of the most amazing “fantasy” cars & vehicles for TV Shows, Movies, Commercials, and, Special Projects ! 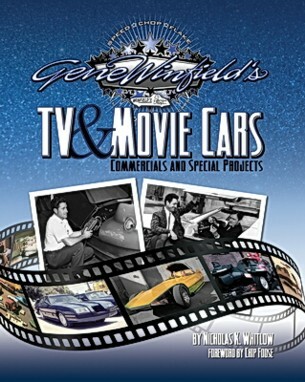 Our early-Sunday Morning Interview at the 34th Annual KKOA Leadsled in Salina, Kansas, focused on this GREAT new book of Gene’s entitled “Gene Winfield’s TV & Movie Cars, Commercials and Special Projects”. I wanted to know how it all started, so you’ll hear Gene tell the stories of his “Blade Runner” cars, the “Cut-In-Half ’67 Chevrolet, “Bewitched” TV’s “The Super Car”…and find out how you can get your copy of this SUPERB new book !